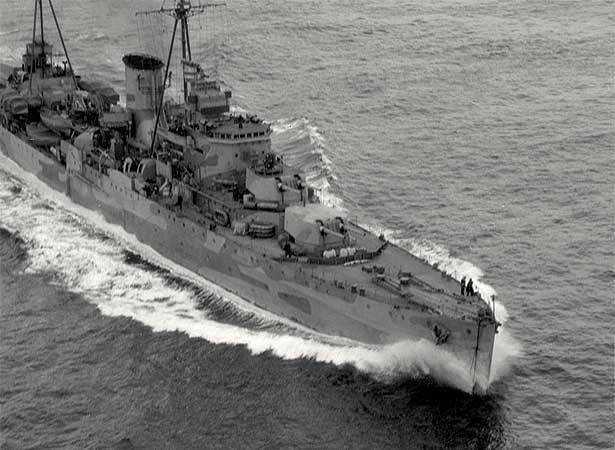 In New Zealand’s worst naval tragedy, the Royal Navy cruiser HMS Neptune struck enemy mines and sank off Libya. Of the 764 men who lost their lives, 150 were New Zealanders. In early 1941, New Zealand provided crew for the Leander-class light cruiser HMS Neptune, which was to serve alongside its existing ships Achilles and Leander. The Neptune headed to the Mediterranean to replace naval losses suffered during the Crete campaign and joined Admiral Cunningham’s Malta-based Force K.
On the night of 18 December, Force K sailed to intercept an important Italian supply convoy heading to Tripoli, Libya. At around 1 a.m. on the 19th, 30 km from Tripoli, the ships sailed into an uncharted deep-water minefield. The Neptune triggered a mine, then exploded two more as it reversed to get clear. Several attempts were made to assist the stricken cruiser, but when the destroyer HMS Kandahar also hit a mine, the Neptune’s Captain Rory O’Conor flashed a warning to other ships to ‘Keep away’. The Neptune struck another mine shortly afterwards and sank within minutes. Only one crew member survived. We have 11 biographies, 25 articles, related to HMS Neptune lost in Mediterranean minefield.